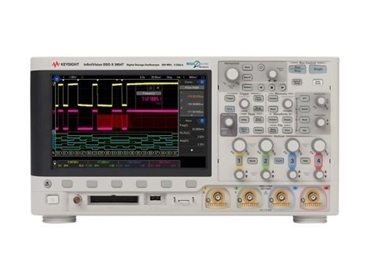 Measurement Rentals has added the new Keysight DSOX3054T 4-channel, 500 MHz oscilloscope to their extensive test and measurement rental fleet. Featuring an 8.5-inch capacitive touchscreen, the Keysight DSOX3054T oscilloscope offers several capabilities including zone triggering, gated FFT measurements to speed up debugging times, and an update rate of over 1 million waveforms per second. Keysight DSOX3054T oscilloscopes offer serial protocols for embedded serial triggering and analysis (I²C, SPI); computer serial triggering and analysis (RS232/UART), sensor triggering and analysis (SENT); automotive serial triggering and analysis (CAN/CAN-FD (CAN-FD ISO)/CAN-dbc/LIN/LIN symbolic); CXPI serial triggering and analysis; FlexRay serial triggering and analysis; audio serial triggering and analysis (I²S); MIL-STD 1553 and ARINC 429 serial triggering and analysis; and USB-PD serial triggering and analysis, all supported by the user-definable Manchester/NRZ trigger and decode software. It also has measurement applications for WaveGen 20 MHz arbitrary/function generator, power analysis, Frequency Response Analysis (FRA), near field communication testing, mask limit testing and enhanced video/TV application package. Measurement Rentals offers a wide range of test and measurement equipment at daily, weekly and discounted monthly rates. For more information, please visit www.measurementrentals.com.au.